As time moves on, many forms of equipment become more accessible to the people who can benefit from them. Today, automotive lifts are the most available they’ve ever been, with countless types to choose from depending on your needs. It’s the perfect time to go DIY. There was once a time when the automotive lift was a technology only designed for and available to professional mechanics and their commercial garages. This was both a question of cost and practicality. Lifts weren’t always available in as many types and sizes as they are today, so they were mostly fitted for spaces that were large enough to accommodate them and that depended on them for business. This narrow degree of variety and extremely high price range meant that drivers were entirely dependant on professional mechanics, unable to explore restoration and other DIY tasks in the same way that is possible now. Fortunately, things have changed. 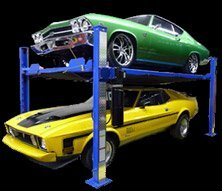 Vehicle lifts are not only more affordable for home DIY car enthusiasts, they come in a stunning variety. This is true in regards to budget range, form factor, and purpose. Both mechanics and hobbyists alike have access to lifts designed for storage or maintenance, with accessories and upgrades available to maximize versatility. Whether it’s a single post storage lift, a four-post industrial lift, or a multi-tier puzzle-style parking lift, there’s one for every job. A home garage can be well-equipped with the right tools and a set of jacks and jack stands, but the addition of a lift is the only way to truly complete your setup. It’s one thing to know there’s a car lift somewhere out there for your needs and budget, but actually finding it is another story. The downside to increased availability and variety is that there are far too many lift dealers selling inferior models to clients at unfair prices. In order ensure that you’ll get the most value from your purchase, you should be selective about who you get your lift from. Look for a team of experienced lift specialists who are not only reputable, but who are committed to selling high-quality lifts at a price that’s right, offering an unbeatable warranty and customer experience to go with it. There’s never been a better time to be a car lover! After seeing too many car hobbyists get the short end of the stick when purchasing lifts for their home garages, we decided to start selling high-quality units at accessible prices. For an unbeatable value and experience, get in touch with Lift King by calling (403) 283-1020 today!